If you are confused about how to backup iPad to computer, just read this guide to get one simple method to help you backup iPad to Mac or PC. Download AnyTrans prior to save your time before reading this guide on how to backing up iPad to computer. You probably keep some very valuable data on your iPad, whether the photos of your families or the email addresses of your most important business contacts. You definitely don't want to lose any of them. But what if your iPad get lost, stolen, or severely damaged? If you backed up your iPad data to computer, it will still be available to you in a pinch. So, the question may perplex you: How do I backup my iPad to my computer? Yes, you can backup your iPad with Apple iTunes or iCloud. Using iCloud to backup your iPad to your computer is a great option to ensure your data to be effectively uploaded to your account. This process allows you to create an iPad backup that you can access anytime and anywhere as long as there is a computer with Internet access. What may upset you is that Apple iCloud only provides you 5GB free storage, and you need to pay for extra space. As for iTunes, besides creates backups of your iPad right on your computer, iTunes can do much more in terms of helping you manage your iOS device. That's why it is a huge program to run on your computer. 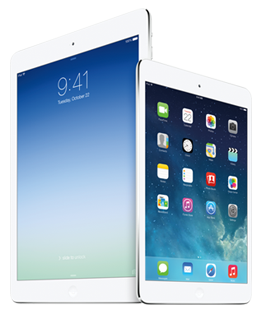 In addition, it won't support backing up iPad selectively and you cannot access the backup files freely. Here in this guide we will show you a third option – back up iPad to computer with AnyTrans – the perfect iTunes alternative. Let’s first take a brief look at it. 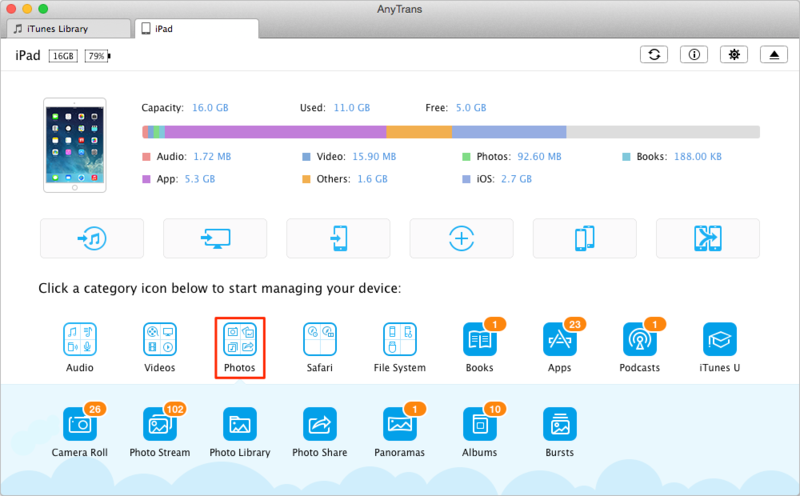 AnyTrans is one professional iOS data transfer tool that can always put your important iPad content in the right place. It can help you backup iPad to Mac/PC computer easily, including photos, videos, music, books, iTunes U, podcasts, contacts, notes, apps etc. 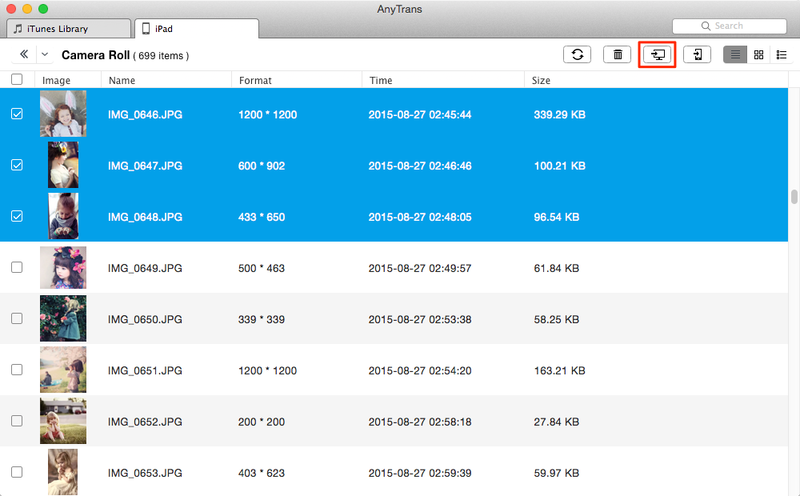 You can preview and select the contents you want to backup and access the backup files freely. 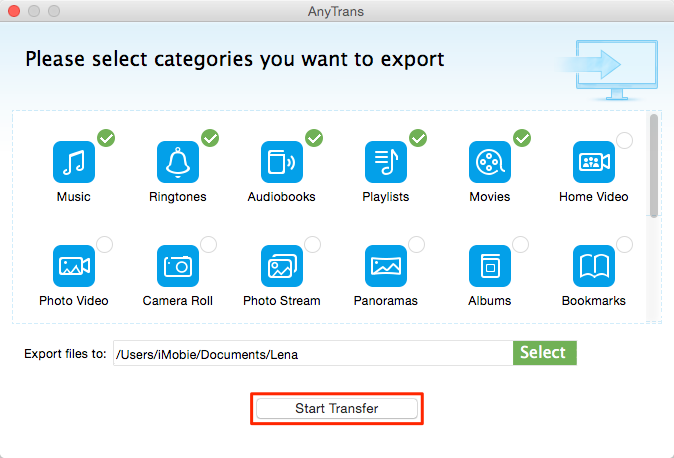 AnyTrans also supports multiple transferring directions, so you can transfer files from computer/iTunes to iPad without data loss and even from iPad to another device directly. Step 1. Open AnyTrans > Connect your iPad to computer > Click on Content to Mac/PC shortcut button on the homepage. Step 2. Select the items you want to backup > Click on Select button to set the destination > Click on Start Transfer. Or you can first preview and select the contents you want to backup. Here take photos for example. Step 1. Click on Photos on the homepage > Select one category. Step 2. Choose the photos you want to backup > Click on To Computer button. As you can see, you can easily backup iPad to computer easily. So why not to have a 7-day free trial? If you meet any problem when using AnyTrans, just send and email to tell us, we will help you out as early as possible.